It’s been a tough few months at Lotus, with the takeover of Proton by DRB-Hicom and the associated funding freeze slowing production to a crawl and pushing out the launch and development of future models like the Exige S, Evora GTE and the next generation Esprit. Further more the whole future of not just the 5-year plan set out by Dany Bahar in 2010, but Lotus as a whole, was thrown in to doubt as rumours began to build. DRB-Hicom came to an agreement to buy a 43% stake in Proton, Lotus’ owner, from the Malaysian government in mid-January, and in doing so brought in a 90-day freeze on Proton’s subsidiaries drawing funds from their parent companies under the Malaysian stock exchange regulations. The move came as a surprise to the top brass at Lotus and came at an inopportune time as the company looked to finalise the Exige S and it’s supply chain, along with continuing the development of the Esprit and the factory in which it would be built. Instead the company had to focus on managing it’s cash flow over the 90-day period, cutting production back to 2 days a week and scaling back development work on the Esprit and other projects to allow the company to make it through the 90 days. Rumours of serious issues began to build on April 10th with Sniff Petrol releasing a photo send-up of Group Lotus CEO Dany Bahar, showing him as the former Iraqi Minister of Information, Comical Ali, who informed the world that Baghdad was still under Iraq control even as the city burnt behind him. At almost the same time Caterham Group Chairman Tony Fernandes posting out on Twitter – “So the story is coming full circle. The 2 guys who wasted so much money taking us to court are gone.”, referring to the legal battle between Group Lotus and the former Lotus Racing/Team Lotus F1 team and fuelling speculation that Dany Bahar had left the company. 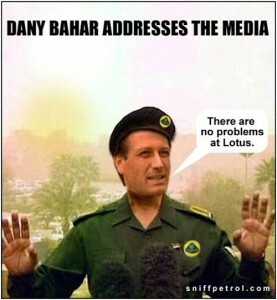 While the spreading of unconfirmed rumours by a put-out competitor isn’t the most professional of actions the media took note, and soon articles were circulating predicting Lotus’ demise along with reports that Bahar was out the office ‘on leave’. After a day of unanswered questions Lotus PR responded in confusing fashion, recycling the Sniff Petrol image from the day before and sending out a somewhat informal Press Release telling people to “Never let the facts get in the way of a good story….” and going on to attack Tony Fernandes and Joe Saward. Reactions to the release ranged from non-conformist fighting spirit to scare disbelief. The following week Bahar returned to Hethel, clarifying where he’d been the previous week (on a business trip to the Middle and Far East meeting with distributors and future dealers) and talking about the issues surrounding Lotus in interviews with the UK press including CAR and EVO. In these interviews Bahar discussed the recent take over of Proton by DRB-Hicom, the effect this has had on funding, development and manufacturing, Formula 1, the potential of a future sale of Lotus and how the company is progress in it’s 5 year business plan – painting a far more upbeat picture than had been filling the news in previous weeks. Since then DRB-Hicom have released a statement that they have “not decided to sell Lotus Group” and clarifying that they are supporting Lotus from a financial and management perspective now that the 90-day funding freeze has ended. Lotus have also announced that production is ramping up to full speed again, with things expected to return to their normal level of throughput by the first week of May, giving the company the chance to get to work on the 1162 currently on order. Although it’s impossible to say with any certainty what the future holds for Lotus, it’s looking a lot more positive than this time a few weeks ago. Once the audits have been completed by DRB-Hicom the company may opt to continue with the 5-year plan, something they can certainly afford with their $4bn case reserves, or to sell on Lotus, most likely either to Lotus F1 Team owners Genii Capital or Chinese Lotus distributor Youngman. While exact details may be unclear there is still a lot to look forward to in Lotus’ future, with the Elise S and Exige S both set to finally arrive with customers in the coming months, along with the promise of a pair of surprises at this years Goodwood Festival of Speed. Here’s hoping we get to see it all.